The Independence of the Seas will provide an unforgettable experience for all travelers, from thrill seekers to those who want to relax and enjoy the scenery. Besides its two sister ships, the spectacular Independence of the Seas is the largest cruise ship in the world. At more than 1,112 ft. in length, the ship is a masterpiece of architecture both inside and out. 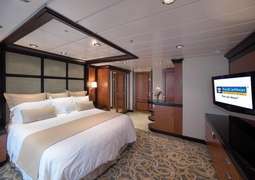 Ultra-modern staterooms and luxurious Suites impress you with their spaciousness, facilities and stylish décor. Boredom is an alien word on board the Independence of the Seas, with a plethora of activities to enjoy such as ice skating, rock climbing, golfing, surfing on the FlowRider or enjoying Royal Caribbean’s world-famous entertainment program. The on-board gastronomy is also impressive, with delicious buffets and incredible specialty restaurants all a delight to the palate. Come evening, electric Broadway shows at the Atrium and the excitement of the casino awaits you. Plan your dream cruise vacation on board the Independence of the Seas. 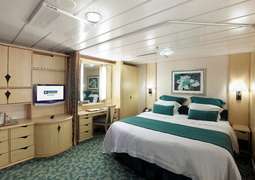 The Independence of the Seas features a range of Interior, Oceanview and Balcony staterooms and various luxury Suites. 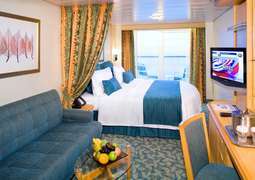 No matter which stateroom type you choose, you will enjoy the highest level of comfort on board. Delightful dining options await you on board Independence of the Seas. Pamper your palate in the all-new Giovanni’s Table Italian restaurant Chops Grille steakhouse or new vintage-style gourmet bakery The Cupcake Cupboard, which offers 30 types of cupcakes! When it comes to entertainment, Independence of the Seas is synonymous with F-U-N! There are incredible exclusive at-sea innovations to discover, such as the FlowRider surf simulator. Entertainment enthusiasts can indulge in evening shows at the theatre, parades on the Royal Promenade, Karaoke, and Cinema. An award-winning Adventure Ocean youth program makes Independence of the Seas fun for the whole family. In addition to a great range of onboard sporting facilities such as mini golf, ice skating and rock climbing, Independence of the Seas also offers superb wellness facilities to relax and unwind. Kick back in one of Independence of the Seas’ several hot tubs, retreat to the adult’s only Solarium pool or visit the luxurious Vitality Spa. There is no strict dress code on board Independence of the Seas. 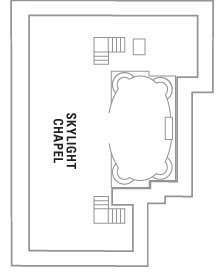 During the day, comfortable, casual clothing is recommended and we advise you to adhere to respective evening attire for special evening programs. When traveling on board the Independence of the Seas, all cruisers under the age of 18 are considered minor. Both children under the age of 18 and youth under the age of 21 are required to be accompanied by an adult. Internet: Internet access is available in the internet café for a fee. The Independence of the Seas is a Freedom-class vessel from Royal Caribbean. 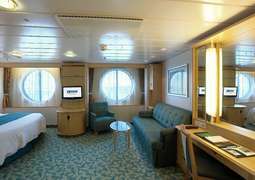 A marvel of maritime engineering, Independence of the Seas, entered service in April 2008 and since then it has given many passengers the pleasure of traveling aboard its wonderful 15 decks. A family-friendly ship is featuring numerous fun-filled onboard activities and astounding entertainment. Refuel, recharge and relax, the Independence of the Seas is your escape from the fast pace and pressure of the city life. Sail on this magnificent ship in the Caribbean and Europe among other memorable destinations. Like the other Freedom-class vessels, Independence of the Seas is packed with the phenomenal onboard experiences including the FlowRider surf simulator, a rock climbing wall, ice-skating rink, mini golf and tai chi courses, cantilevered whirlpools and much more. And of course, the ship offers a range of shops, lounges and pubs. For kids and families, Independence has something for every day. Sit back and watch Broadways smash hit, Grease the Musical. Games, events and activities are going on all over the cruiser throughout the day making family time a great time at the sea. On Royal Caribbean ship Independence of the Seas, your kids can sail with Madagascar, Shrek and the Kung Fu Panda characters. Go ahead, have the cruise holiday you have been wishing for. Once onboard the Independence, you will enjoy dining options that are rich in flavor and ambiance. Savor dish after dish of fine cuisine at the Main Dining Room and take your taste buds on a scrumptious culinary journey. For a fantastic buffet with spectacular vistas, visit the Windjammer Café. Jade Sushi features innovative Asian-fusion dishes along with classic favorites. This Japanese spin-off is worth a visit and trying out its wide-ranging menu of salads, soups, fried rice and of course sushi and sashimi. For a taste of variety, be sure to check out the intimate Portofino restaurant with its Italian delights. When you find yourself craving for something light, drop by Seven hearts and simply enjoy a snack while taking in the ocean views. In any case, this ship is a real gastronomical adventure.